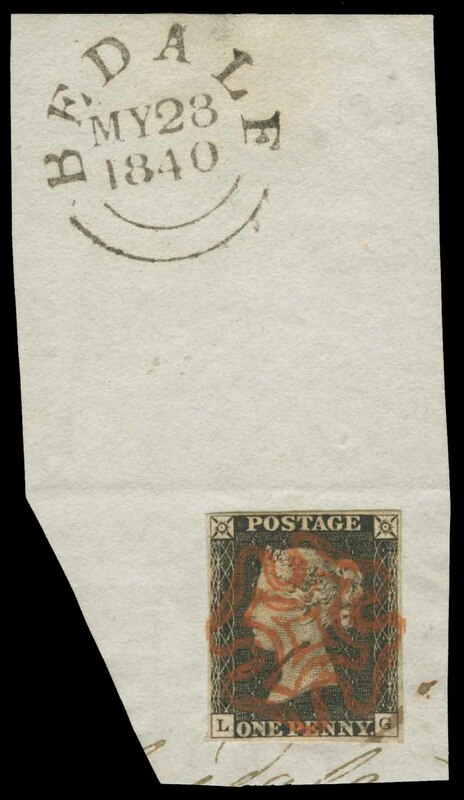 Collection of 33 Pre-Stamp Covers, stamped covers and Postal Stationery items from 1795 to 1910, mostly sent from or to Bath with a variety of stamps affixed and various Postal Markings. Attractive lot. 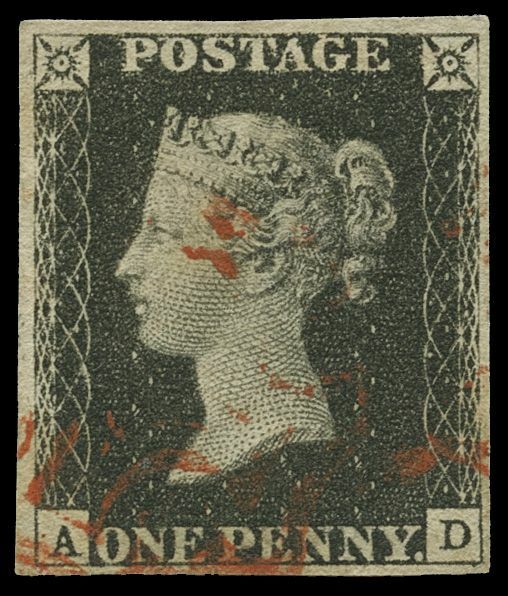 1840 1d Black Queen Victoria imperf from Plate No 2 fine used, with 3 margins,and Black Maltese Cross cancellation (corner letters D.F.) 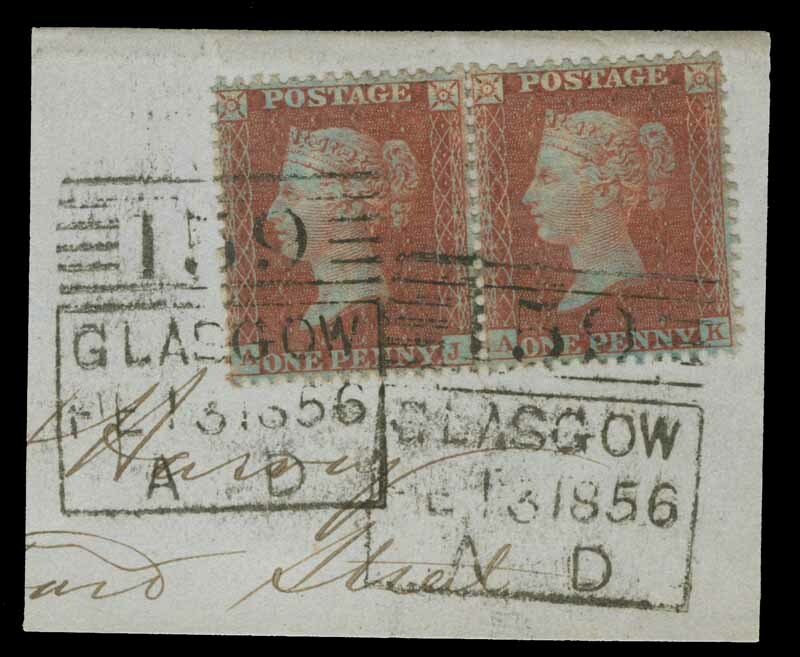 and another from Plate No 5 used, with 4 margins, a few small creases and nick, cancelled by a Black Maltese Cross cancellation (corner letters C.I.) Sg 2. Catalogue Value £700.00. 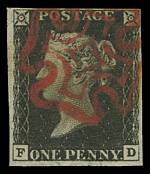 1840 1d Black Queen Victoria imperf from Plate No 4 fine used, with 4 margins, close at top, cancelled by neat Red Maltese Cross cancellation. Corner letters F.D. Sg 2. Catalogue Value £375.00. 1840 1d Black Queen Victoria imperf from Plate No 4 fine used with 4 good margins, tied to 1840 entire by a Red Maltese Cross cancellation. 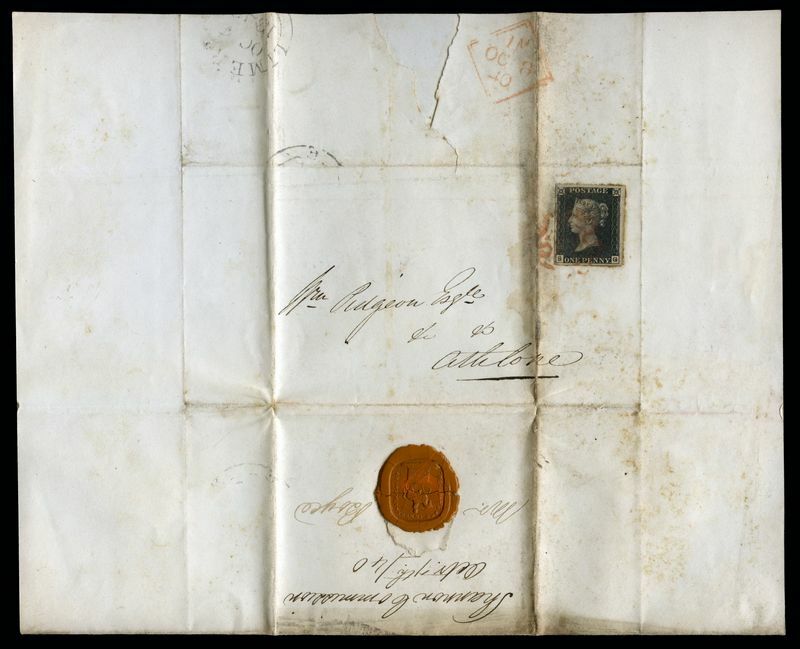 Sent from Limerick to Athlone Ireland, with part Limerick CDS transit marking on reverse. 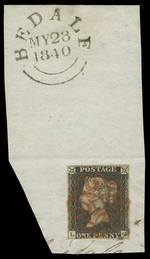 Corner letters S.G. Two folds clear of the stamp and some water staining. 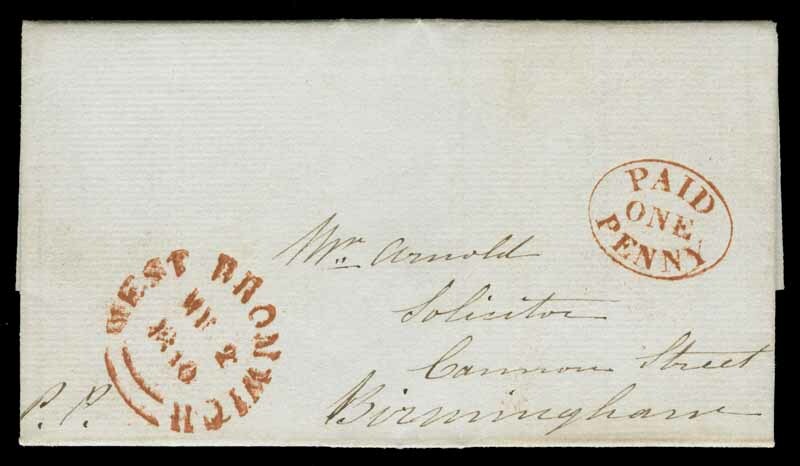 Also 1840 1d Black Queen Victoria imperf from Plate No 7 with 4 margins, tied to an 1840 entire by a Red Maltese Cross cancellation addressed to Boyle, Ireland, with Boyle and Collooney CDS transit markings. The front of the entire has notes written entirely over it, with some pen marks on the side of the stamp. Corner letters I.H. 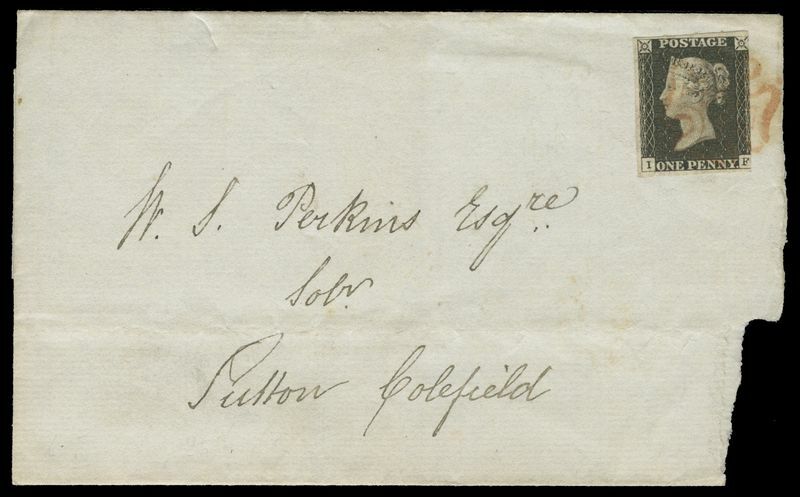 Rarely seen early Irish Postal History. Sg 2. Catalogue Value £1,600.00. 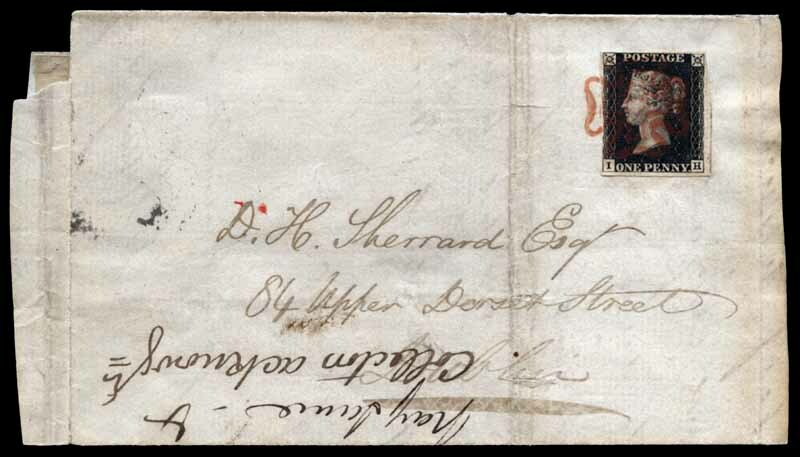 1840 1d Black Queen Victoria imperf from Plate No 5 fine used with 4 good margins, tied to a small 1840 cover by a faint Red Maltese Cross cancellation. 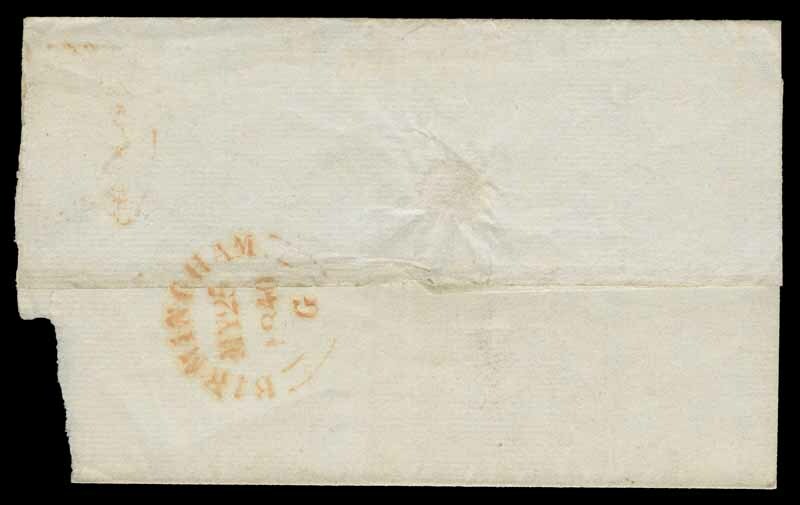 Sent from Rockingham, Ireland to Dublin, with Boyle CDS transit marking on reverse. 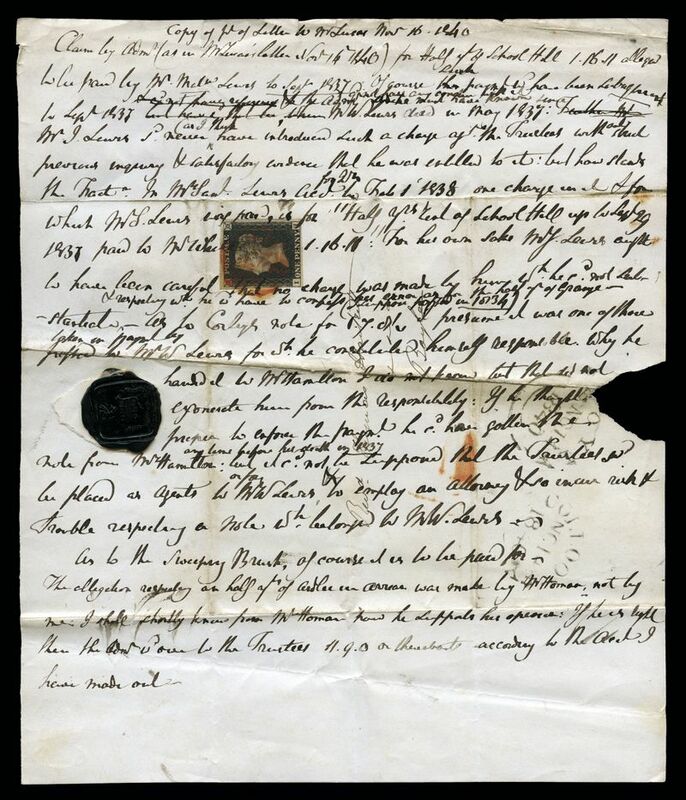 Includes a letter from Viscount Lorton (General Robert King), who was reputed to be the wealthiest man in Ireland. 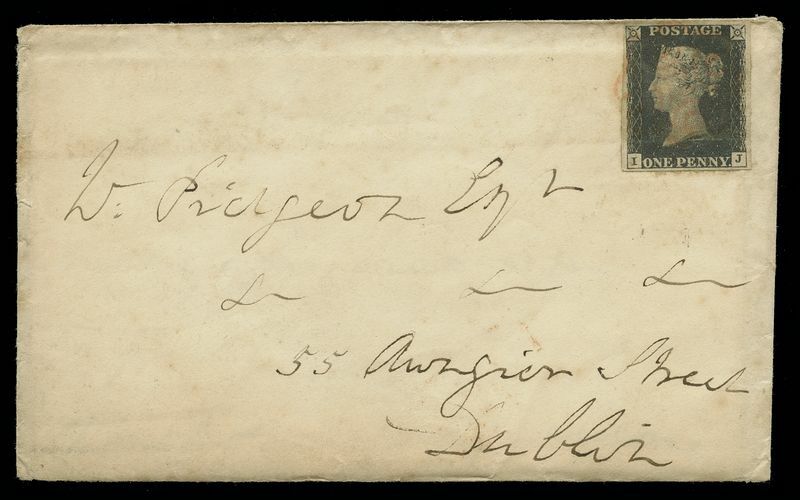 Much scarcer than English usage and a fine example of early Irish Postal History. Corner letters I.J. Sg 2. 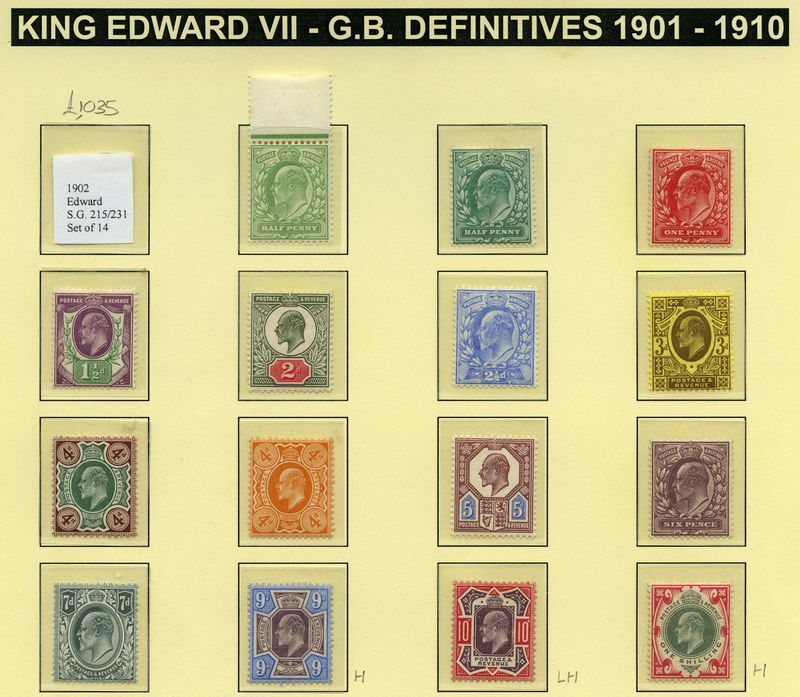 Catalogue Value £775.00++. 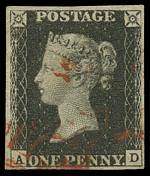 1840 1d Black Queen Victoria imperf from Plate No 6 with 4 good margins fine used with light Red Maltese Cross cancellation. 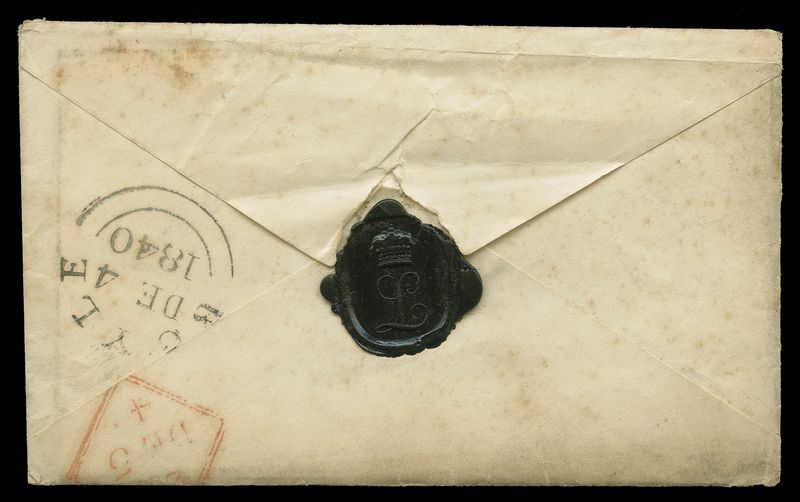 Corner letters A.D. Sg 2. Catalogue Value £375.00. 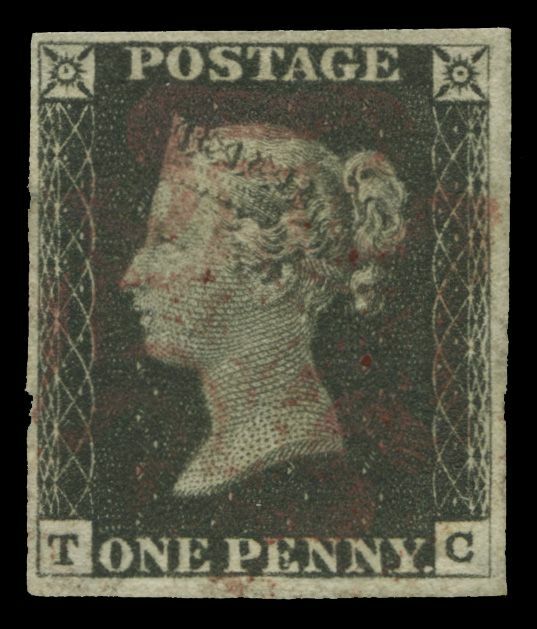 1847-54 Queen Victoria Embossed set of 3 cut square used, the 1/- Pale Green with 4 good margins, the 10d Brown with 2 margins and the 6d Mauve just touching on all sides. Sg 54, 57 and 58. Catalogue Value £3,500.00. 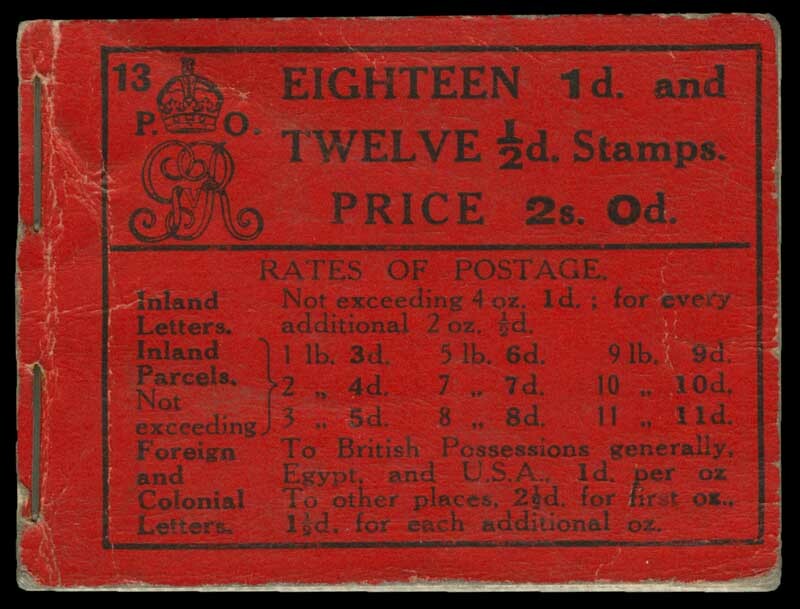 1929 £1 PUC fine used. Lightly creased in upper right and lower left corners. Sg 438. Catalogue Value £550.00. 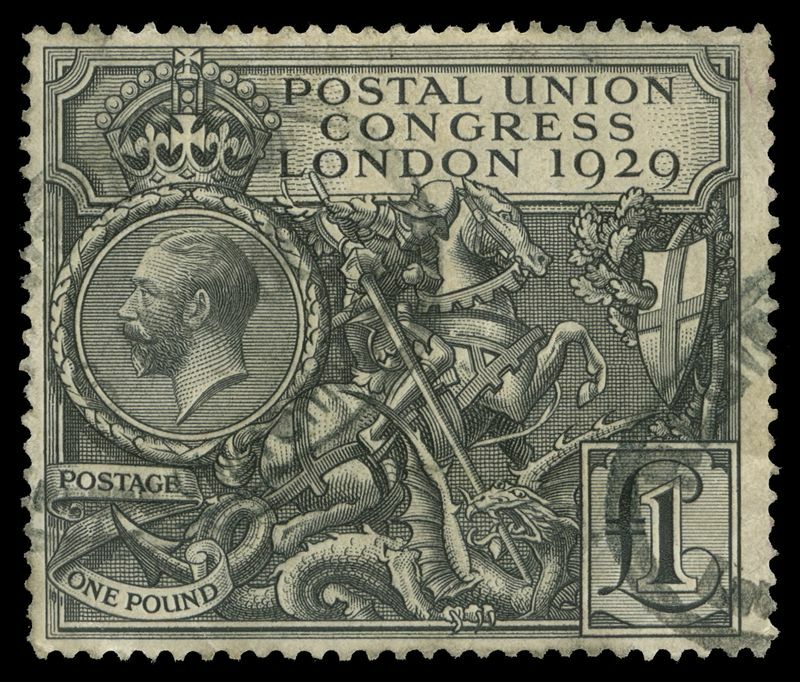 1934 Re-Engraved Seahorse set, including additional 2/6 and 5/- values used. 10/- Value has creased corner. Also 4 different 1/- KGVI booklets from 1947-52. Sg 450-452, BD4-5 and BD7-8. Catalogue Value £460.00. 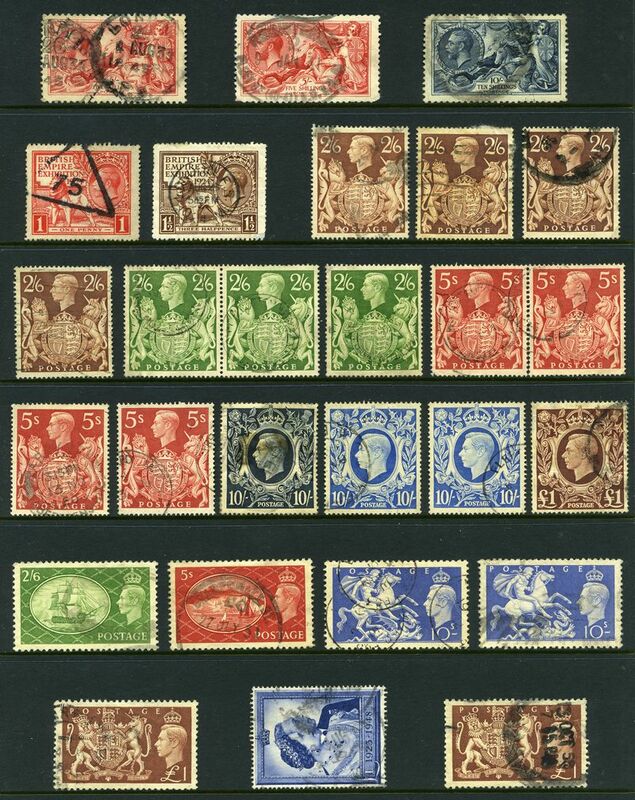 1939-48 KGVI High value Definitive set of 6 MLH. Sg 476-478c. Catalogue Value £425.00. 1948 Royal Wedding set and 1951 Festivals High Values set MUH. Sg 493-494 and 509-511. Catalogue Value £140.00. 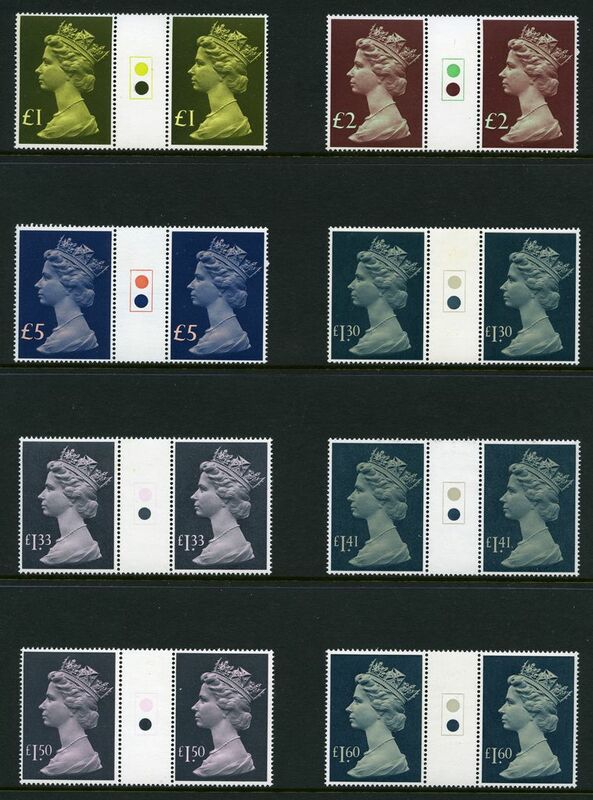 1968-69 4/6 (20), 5/- (8), 6/- (28) and 10/- (12) QEII booklets MUH. Sg LP46-50, HP26-27, QP38, QP40-45, XP4-5 and XP7. (4 of each). Odd cover fault, some with marks on edges, caused by perished rubber bands. Catalogue Value £217.00. 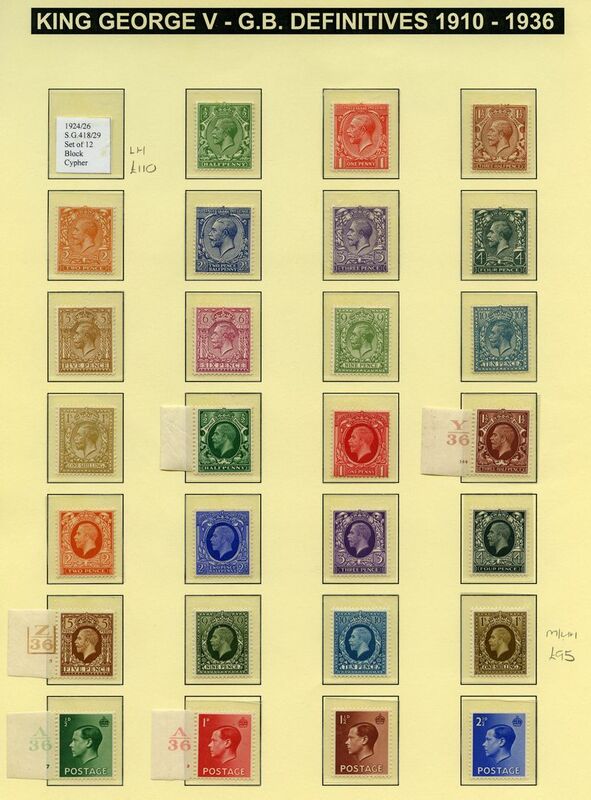 Collection of mostly MUH stamps from 1887 Queen Victoria Jubilee set to 1/- Green and Carmine (ex 1/- Green) to 1967 Wildflowers set, including 1902-13 KEVII set to 1/- value, 1912-24 KGV Wmk Royal Cypher and Wmk Block Cypher sets, 1934 2/6 and 5/- Re-engraved Seahorses, 1924-25 British Empire Exhibition sets, 1948 Royal Wedding set, 1951 Festival set (10/- creased), 1959 QEII Phosphor-Graphite Wilding set and complete Ordinary and Phosphor sets from 1962 onwards. 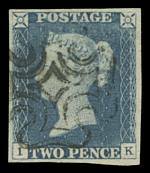 Some early issues lightly hinged and odd minor blemish. Catalogue Value $3,956.00. 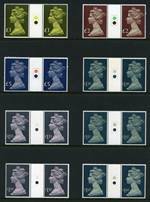 Collection of hundreds of MUH Decimal Machin Head issues from 1970 to 2011 including phosphor and gum variations, elliptical perforations and 1977-87 High Value set of 8, plus 1988 Castle set, 1993 £10 Britannia and 1994 Postage Due set MUH. Good variety with some duplication. Collection of unfolded Traffic Light gutter pairs from 1974 to 1987, including 1977-87 High Value Machin Head set of 8. Several sets in blocks of 4. Catalogue Value £416.00. 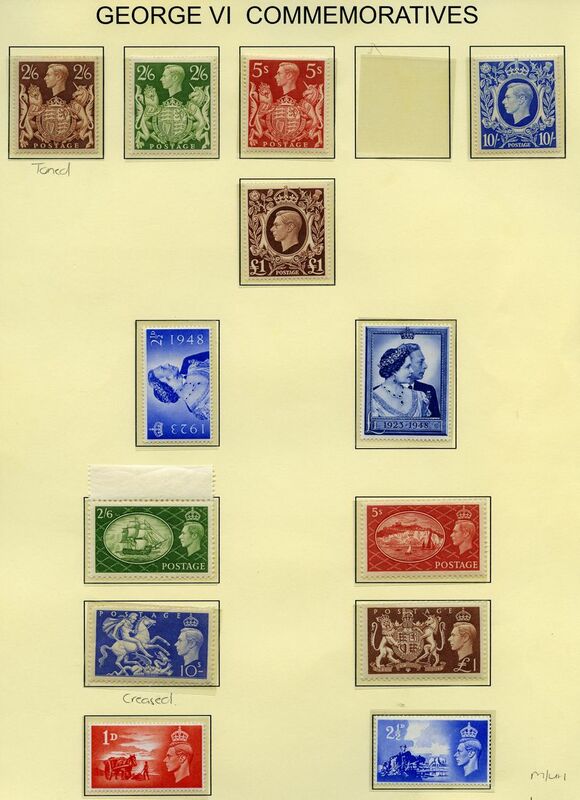 Collection of MUH stamps from 1971 to 1999 in 2 volume Royal Mail Hingeless stamp album, plus a range of duplicates and booklets. Face Value £553.00. Also 5 Stamp and Coin PNC's from 1997 to 2000 containing 2 £1 and 3 £5 coins. 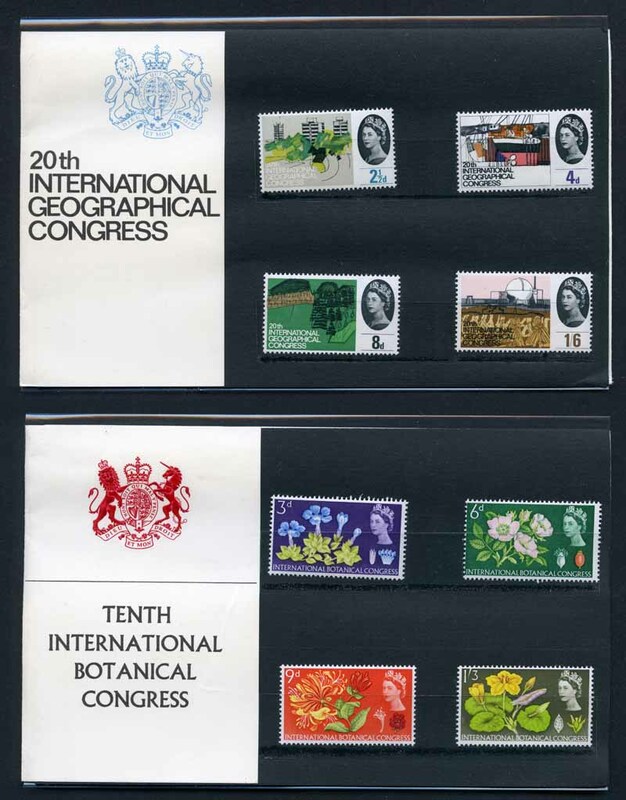 Accumulation of 3,390 MUH Pre-Decimal stamps from 1967 to 1970, mainly in large blocks including numerous commemorative sets and range of Machin Head and Regional issues, plus 1973 Royal Wedding set in MUH half sheets of 50 (200 sets) including two sets of Traffic Light unfolded gutter pairs. 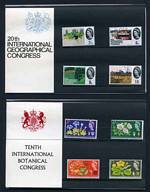 Also range of miscellaneous items and covers including British Indian Ocean Territory 1968 B.I.O.T. 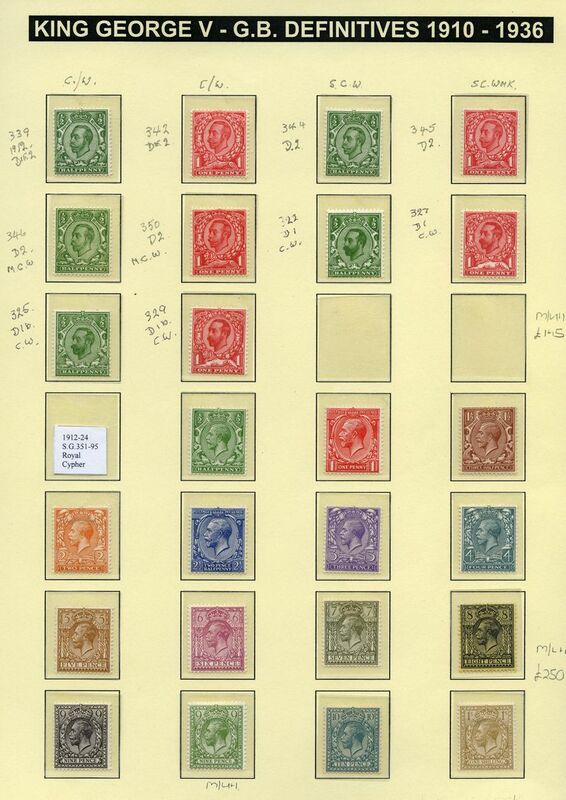 Definitive set MUH (3 sets) and small accumulation of Australian MUH Decimal issues with a face value of $59.00. Selection MUH stamps, booklets and FDC's from 2013 to 2016 including 2015 The Making of Star Wars, 2016 500 Years of Royal Mail and 2016 The Queen's 90th Birthday Prestige booklets (2 of each) and 7 different Prestige definitive booklet panes on official typed addressed FDC's. High retail value. 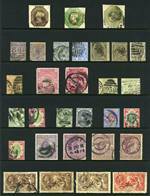 Accumulation of MUH Decimal stamps from 1971 to 2007, including numerous commemorative sets, miniature sheets and some booklets. Face Value £772.00. 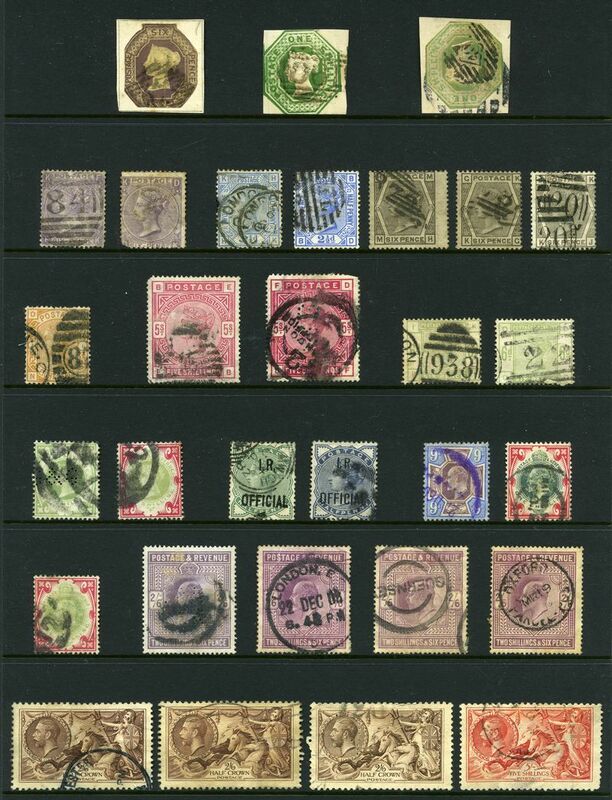 Selection of 57 used stamps from 1847 to 1948, including many highly catalogued items. 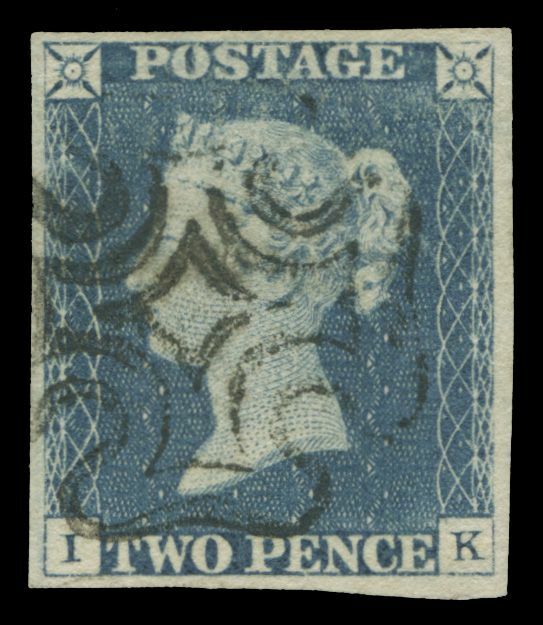 Typical mixed condition and some duplication. 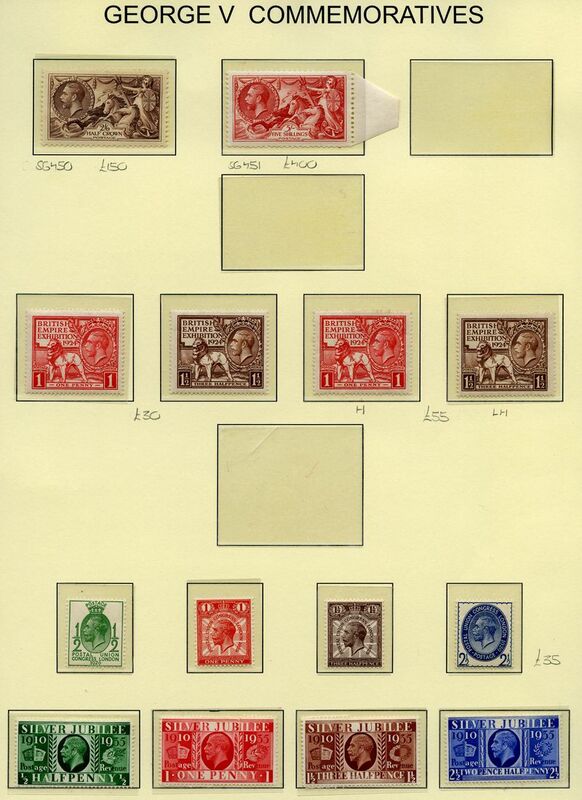 Collection of MLH, MUH and used stamps from early to modern in 5 good quality stockbooks, with useful sets and highly catalogued items and some Channel Islands. Mixed condition. 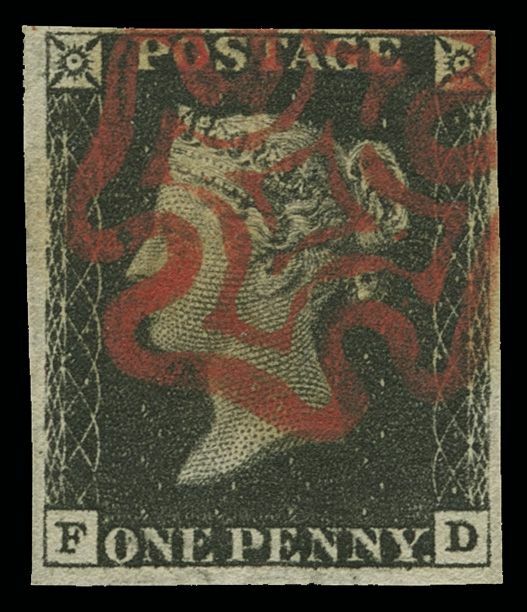 Heavily duplicated accumulation of stamps sorted into packets, in carton with many Machin Head issues and some commemorative content. 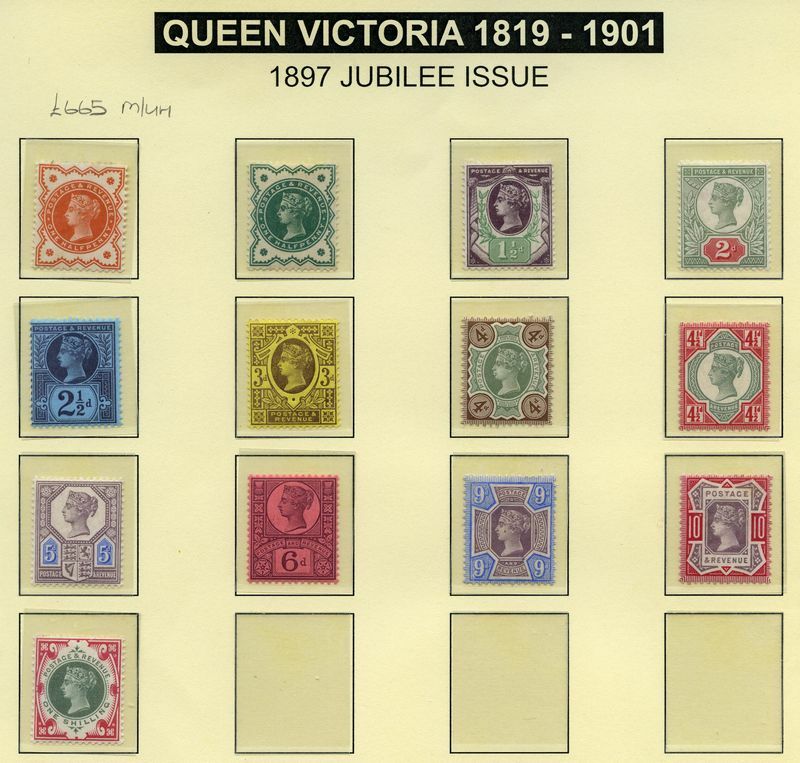 Collection of hundreds of mint and used stamps from Queen Victorian era to 1986, including handy items and largely complete MUH from 1972 to 1986 in 2 loose leaf albums.